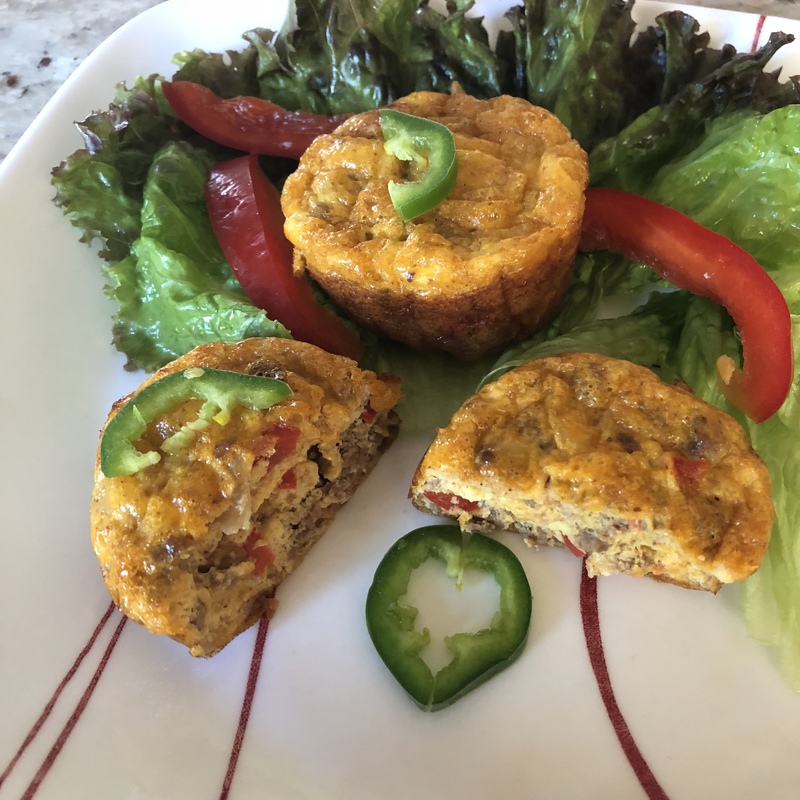 Taco Mini Quiches, Low Carb Brunch – What's for dinner, Doc? Here’s a quick meal prep idea for your low carb diet. I make a batch of mini crustless quiches most weeks and eat them for brunch or lunch. You can add any vegetables, protein and or cheese to use what’s available and to tailor it to your personal taste. These have ground beef but you can change to ground turkey or leave out the meat completely. Eggs are a great source of protein by themselves. Preheat the oven to 350 F. Lightly oil a non-stick muffin pan. Lightly beat 6 eggs, add combine with 1/2 cup of any shredded cheese and 1/2 cup of cottage cheese or browned and seasoned meat. Add 1/2 cup of sautéed onions and 1/2 to 1 cup of finely chopped crisp tender vegetables. Season with fresh or dried herbs. Your vegetable options are unlimited: spinach, arugula, Swiss chard, broccoli, zucchini, peppers, seeded chili peppers, asparagus. Meat ideas: bacon bits, sausage, ground beef or chicken, even leftover meat. Combine the remaining ingredients with your basic recipe, fill the muffin pan 3/4 full. Bake for 20 minutes. Store leftovers in the refrigerator for up to a week. 6 eggs, 1 cup shredded cheddar cheese, 1 cup browned ground beef, 1/2 cup sautéed chopped onion, 1/2 cup finely diced red pepper, 2 tablespoons finely chopped and seeded jalapeño pepper, 1 teaspoon ground cumin, 1 teaspoon chili powder, 1 teaspoon smoked paprika, 1/2 teaspoon salt, dash of black pepper. I hope you enjoy these easy make ahead Mini Taco Quiches. You might like my Quiche Pinterest Board for more flavor combinations. Crustless quiche, frittata… Potayto, Potahto 😉 Either way, these are brilliant! Right? I couldn’t decide, just baked eggs.